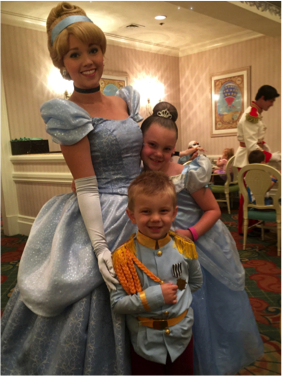 Running on Pixie Dust: Bibbidi Bobbidi Boutique - Is the Magic Worth the Money? Bibbidi Bobbidi Boutique - Is the Magic Worth the Money? Special thanks to my friend Jon Hill for the guest post below! He and his wife have traveled to Walt Disney World and Disney Cruise Line both by themselves and with their two beautiful children. His wife, Christine, is traveling with me in just a few weeks for the Princess Half Marathon weekend and their family is planning another magical trip for this coming summer! From our earliest trips together to Disney nearly 15 years ago, my wife and I always enjoyed stopping to watch the reactions of the young girls undergoing the magical transformations that take place at the Bibbidi Bobbidi Boutique (BBB) with the help of Fairy God-Mothers-in-Training. I’m certain that the very first time we witnessed it, we agreed that if we ever had a girl, she would experience this enchanted, fairy-tale makeover. While planning our Disney trip for the summer of 2016, we decided that our daughter Lily, was old enough that she could appreciate and understand the experience. Additionally, on the first night of our trip we were to have dinner with Cinderella and her friends at 1900 Park Fare at the Grand Floridian resort. Since we were not going to a park on our first day, we made reservations to go to the BBB at Disney Springs. While searching the web for information and tips on BBB, we were pleasantly surprised to find that they also have Knight makeover offerings for the boys. These are very inexpensive, so we signed our 4 year-old son Luke up for a Knight makeover to match his sister and be properly prepared for the Royal Ball as well. 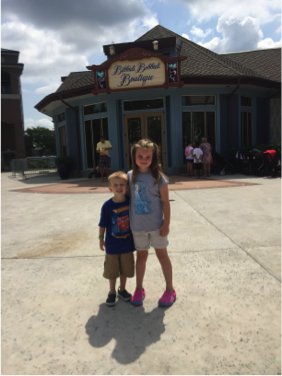 Upon arrival, we were surprised to find out that the BBB had recently undergone renovation and that it now had its own dedicated building instead of sharing space with the World of Disney. The bluish building, with large windows blends into the surrounding spaces, with the exception of the large BBB sign over the entrance. Once inside, the bright boutique reflects the royal setting of a fairy-tale salon with dark wood paneling and trim and fairy-tale murals all around. Having its own space lends to the experience, removing the noise, bustle, and distraction that the hundreds of shoppers in World of Disney brought. The waiting area was appointed with displays of available Disney princess dresses and accessories and the staff was cheerful and delightful as we have come to expect with the Disney experience. We checked in at the desk and after a brief wait, our children were whisked through the large wooden doors to meet their fairy godmother-in-training. The boutique is set up in the round with a several styling stations similar to those found at a typical salon. The large room is beautifully appointed with gold accents, chandeliers, royal draperies, and murals reminiscent of your favorite Disney princess stories. Each of the styling stations is staffed by a fairy god mother-in-training who is responsible for your child’s royal transformation. In the middle of the room is a large, oval, cushioned bench so that parents may sit and watch the enchanted work of the fairy god mothers-in-training. After a brief introduction, the two fairy god mothers-in-training (Kayla and Mary) assigned to our children went to work. Both quickly developed a great rapport with the kids and demonstrated a love for their work. But then again, who wouldn’t love to delight children all day long by magically transforming them into royalty? As part of Lily’s package she received hair, makeup, and nail treatments, as well as a sash. She even received a pink BBB nylon bag with extra styling products to take home with her. Lily’s hair (Fairytale Princess Style) was done so well, that we were able to leave it in overnight and it lasted through the whole next day as we enjoyed rides and had fun at the Magic Kingdom. Having it up and off of her neck was also an added advantage as it helped her stay cool in the late June heat. Luke received a hair treatment and was presented with a mighty sword and shield in a knighting ceremony complete with official certificate. All throughout the makeovers, Disney Photopass photographers assigned to the BBB were snapping a ton of photographs of the kids. These pictures can be purchased after the experience, but if you already have the Memory Maker package, it is awesome. All together we received another 40-50 photos just from this experience alone. As part of the transformation, the children are not permitted to see themselves in the mirror until the makeover is complete. The photographer captured an awesome picture of Lily’s reaction as her chair spun around and she saw herself in the mirror for the first time as a beautiful princess. Following some pictures, we bid farewell to our fairy godmothers-in-training and wished them luck in their quests to become full-fledged fairy godmothers. We then were escorted into a room adjacent to the styling boutique for a photo session. This royal-looking room was outfitted with a kid-sized replica of Cinderella’s magic coach. Photographers took several more posed photos of the kids with the coach. Again, having Photopass is a great option if you are considering BBB. We were permitted to take our own photos with our iPhone, but having the Photopass photographers capturing shots with their digital SLRs produced professional photos to preserve the memories. We bid adieux to the BBB and its friendly staff, but not before being directed to go to the nearby Disney Photopass Station to view our photos. 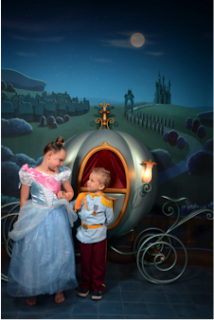 Once there, we were again surprised to receive yet another photo session with both of the kids with a Photopass Photographer. As I said before, if you are going on a multi-day Disney trip and considering BBB, purchasing the Photopass package ahead of time will pay for itself. We got another 20 posed photos here. We had only been at Disney for 6 hours, hadn’t even gone to a park, and already had about 60 Photopass photos in our gallery. After departing Disney Springs we made our way to the Grand Floridian for an early dinner reservation at Cinderella’s Happily Ever After Dinner. We then walked around the resort and took advantage of the Victorian décor and beautiful landscapes to grab some more pictures of the kids. Overall, the BBB was a great experience. The staff was friendly and the individual attention and service the kids received was what we have come to expect from the Disney experience. We did not feel rushed or pushed through the process. As far as the cost, yes it is a little pricey- a hair styling, some makeup, glitter, nail polish, and a sash for $60. 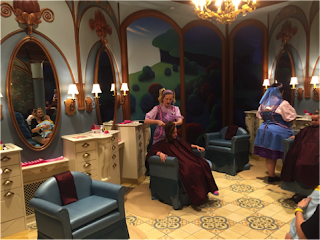 But compare that to what you might spend at a local salon for the same treatment, and it doesn’t seem so out of line… And can you really put a price on the moment when your little girl first sees herself as a real Disney princess? Or the moment when she, in her finest, meets a real, live Disney Princess? The “Knight Package” would definitely fall into the bargain category as the hard foam sword and shield alone (which are pretty nice and durable) are around $15 in the World of Disney Store. 2.) Consider the weather and you activities for that day- If it is the middle of July/August and the humidity will be 90%+, is your child going to enjoy their visit to one of the parks in a full princess dress, with hair and makeup? If it is the summer, opt for an afternoon appointment so you can relax and enjoy the A/C in the BBB during the heat of the day, and make early dinner reservations for character dining at one of the Disney Dining options where you can meet the Princesses. Cinderella’s Happily Ever After Dinner is at the Grand Floridian, so you don’t even have to go to one of the parks if you have a free day. 3.) Leave ample time- I would say to budget 3-4 hours for the whole experience door-to-door. From catching the bus or driving to Disney Springs, visiting BBB, getting pictures, and then making your way to a park, a restaurant, or your hotel. 4.) Save some money- If you want to do the princess dress, bring your own. While the ones offered at BBB are nice, I’m not sure they are worth the extra $140 you will pay. 5.) Check out the BBB website’s “Know Before You Go” information for additional details and more.